Old map by HOGARTH -The Idle Apprentice Executed at Tyburn. Title: The Idle Apprentice Executed at Tyburn. Size: 10.2 x 15.6 inches. 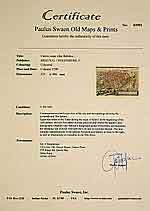 Condition: In very good condition on heavy hand-made, woven paper. 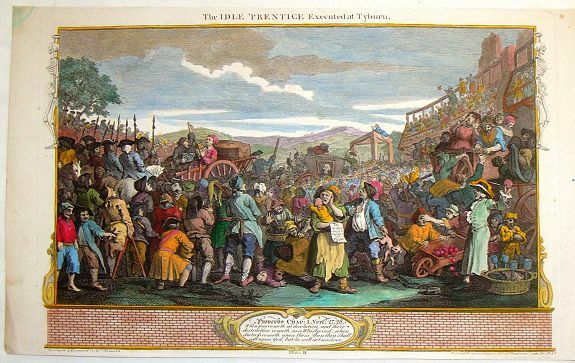 Fine, large, hand-colored copper engraving featuring a crowd gathering to watch the execution of the Idle Apprentice. William Hogarth (1697 – 1764) was an English painter, printmaker, , pictorial satarist, social critic, and editorial cartoonist who has been credited with pioneering western sequential art. His work ranged from realistic portraiture to comic strip-like series of pictures called "modern moral subjects". Knowledge of his work is so pervasive that satirical political illustrations in this style are often referred to as "Hogarthian".